If you’ve ever used Adobe Photoshop, then you know how complicated and frustrating it can be to get used to the controls. While there certainly are endless options for editing in Photoshop, it is almost not worth the hassle. So, for something much easier to use, less pricey, and better looking, Pixelmator 1.5 Spider is a perfect solution. Upon launching Pixelmator, there is one main window for the picture, and then several other floating customizable windows you use for editing. And unlike Photoshop with its grayscale interface, Pixelmator is fun to work with and fits in with the great Mac OS X style. There is the option to edit in fullscreen mode, and also many other features of the interface you can customize. Most of the editing tools are the same as in Photoshop, but they are definitely easier to find and use. While there may be a few less editing tools, there are still plenty to keep you busy with a picture. 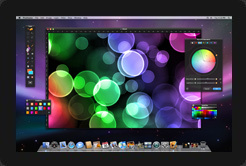 Another way Pixelmator beats Photoshop is in its price: Photoshop at its simplest version is $119.99 while Pixelmator comes standard at just $59.00! In the end, for the Mac user with personal photo editing needs, Pixelmator is surely the way to go.